"Ladies and gentlemen, the following contest is set for one fall and it is for the Divas championship!" Lillian announced. AJ came skipping to the ring, "Introducing first, from Union City, New Jersey, the Divas champion, AJ Lee!" AJ smirked as she held her title above her head. She motioned for Lillian to give her the mic. "Oh, Gabby," AJ said, smiling, "You&apos;re late for our match." She paused as the Minneapolis crowd started chanting, "We want Gabby!" "Come on, Gabby, don&apos;t disappoint your fans!" AJ exclaimed. She waited for ten seconds, "I&apos;m starting to get impatient." No music came on. Nothing happened. AJ started laughing, "Well that&apos;s to bad. Lillian, announce me the winner by forfeit," AJ handed her the mic again. The crowd started booing loudly. AJ ignored them, "Come on, get with it!" Lillian reluctantly put the mic to her lips, "The winner of this match as a result of a forfeit......"
The crowd started cheering loudly, "Hold on a sec, guys!" Cole exclaimed. Aj started looking around with a worried look. The music stopped. AJ started rolling on the floor laughing as the boos became louder. AJ yanked the mic from Lillian&apos;s hand,"I got ya," she started laughing again, "I&apos;m sorry, I had to. You guys are just so easy." "I hate to break this to you all, but Gabby is not coming back. In fact, she is not even Gabby Bryan anymore, she is Gabby Wyatt," AJ chuckled in amusement, "Get it, Gabby Wyatt." The crowd started cheering loudly as AJ nodded to herself, "I know, my jokes are amazing." "I don&apos;t think that&apos;s what they&apos;re cheering for Aj," Jerry said. I stood at the top of the ramp. My eyes narrowed in anger. 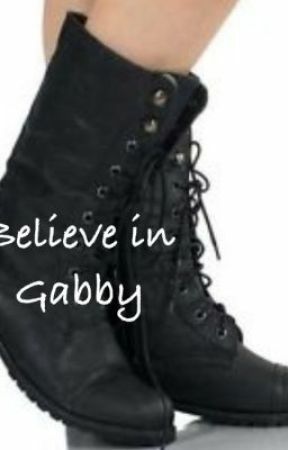 I wore jeans with brown leather boots and a Gabby Bryan T shirt in white. AJ looked at me with worry, but then started laughing, "Gabby, you don&apos;t look to hot." She was right. My right eye was a black eye. If you lifted my shirt off, you could see the huge welts on my back. I started slowly limping to the ring, my face screwing up in pain. "This is not right," Jerry said. The crowd cheered me on as I slowly got in the ring. I didn&apos;t say anything as I nodded to Lillian. Lillian nodded back to me, "And the challenger, from Aberdeen, Washington, Gabby Bryan!" I watched the ref hold the title above his head with no emotion. "What did the Wyatts do to her," JBL muttered as it showed me trying to not let my pain show. "Ring the bell!" the ref yelled as the time keeper rang it. AJ couldn&apos;t stop smiling at me. I glared back at her. She must have set me up. I hadn&apos;t done anything to Summer, had I? AJ walked up to me, "How was it like, Gabby Wyatt?" I took a deep breath, trying to keep my anger in check.